Their data can be downloaded directly here in Excel format that covers 1913-2012. They do not adjust their rankings by unit size (the CBO divides household income by the square root of the household size). 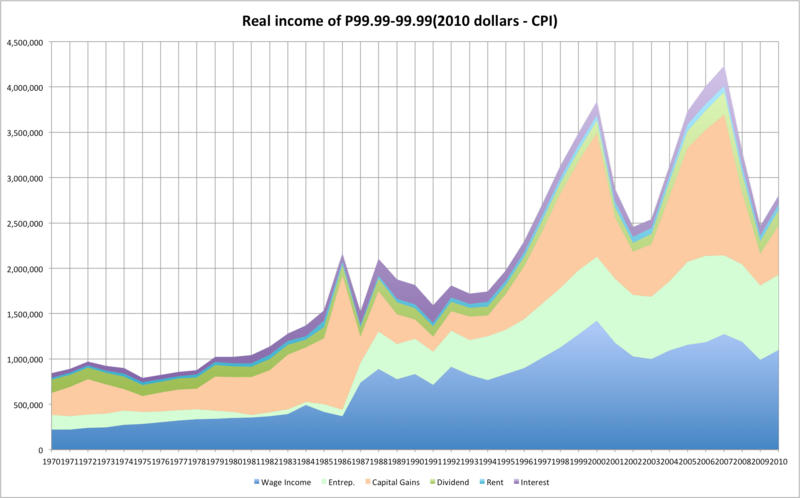 Their “real” incomes are deflated with the CPI, whereas the CBO use the PCE index. So while this data set has its issue and probably isn’t very relevant to income distribution per se, it is a useful and probably relatively accurate picture of the distribution of 90th percentile of top AGIs. The data from P&S provide some pretty powerful evidence for my first two arguments. 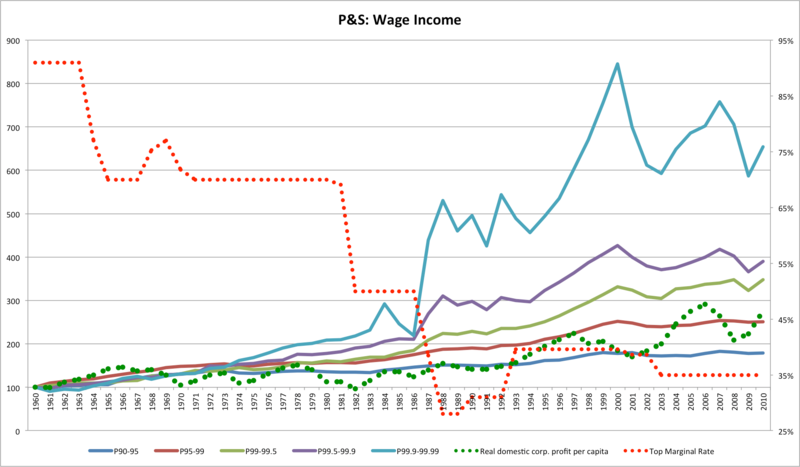 Observations: Between the late 30s and the mid-60s we see a period of rising corporate profitability and rising incomes at the more modest income levels, e.g., 90th and 95th percentile. 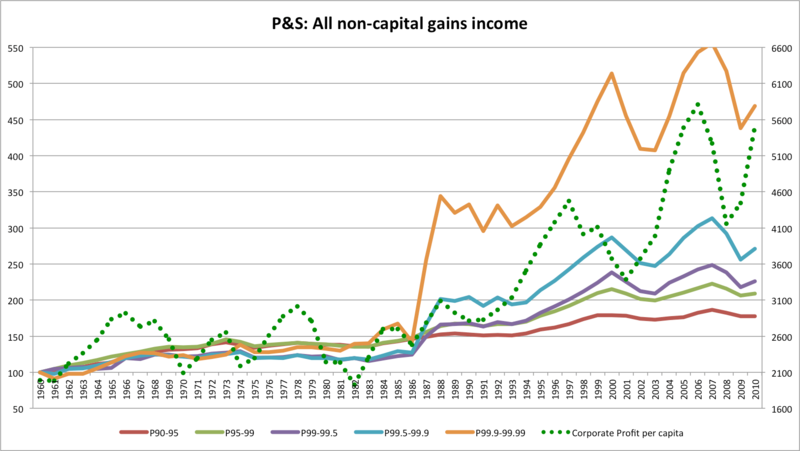 We see essentially no rise in non-capital gain income for the very top income levels for almost 50 years!! In fact, the percentiles appear to converge during this period. 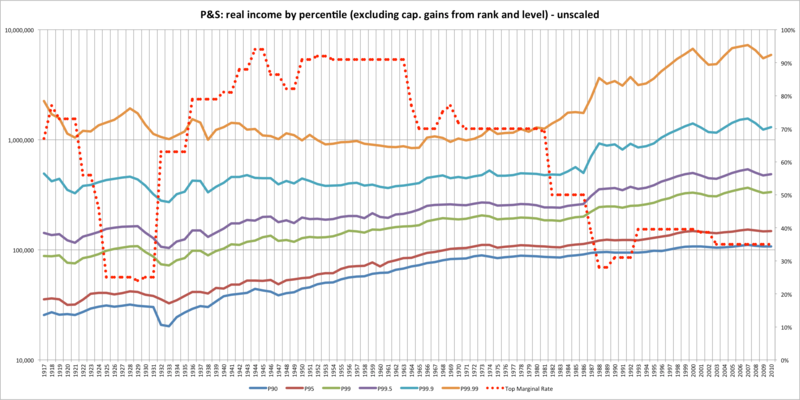 The top incomes only trend significantly up and gain ground on the lesser groups when the top marginal rate is cut in the 80s and they do so implausibly rapidly — jumping almost two to three times their period levels in the space of just a few very short. 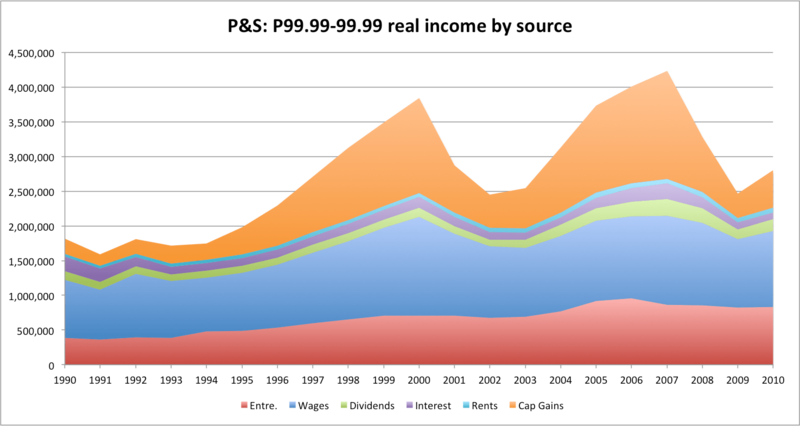 I think the reasons for this are very clear: the very highest income earners would pay a much larger share of their real incomes at the top marginal rates (if they were to actually do so at least) and they typically have more flexibility to plan when and how they report their incomes (relative to people that get most of their incomes from a regular paycheck). They can, for instance, spread their accumulated earnings out over several years or to otherwise find tax advantaged ways to minimize the impact of very high rates. In short: they demonstrate very high elasticity (at least with respect to taxable income). 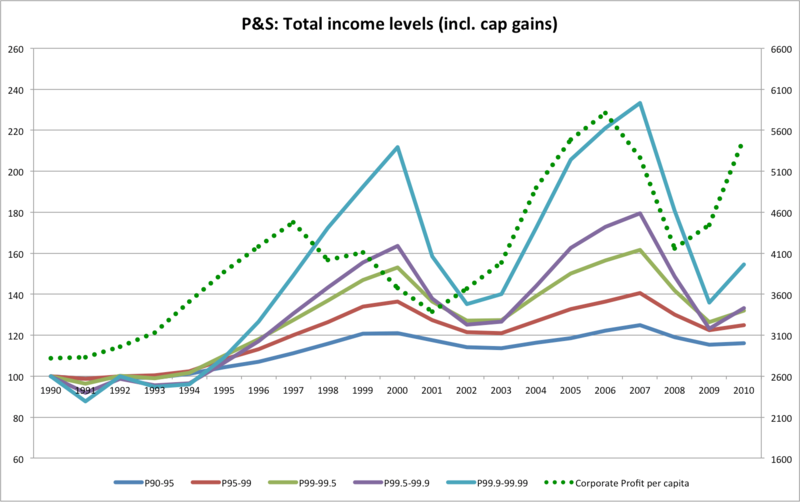 Observation: Capital gains comprise a large and volatile share of top incomes so looking at the total number or absoute share can be a misleading. 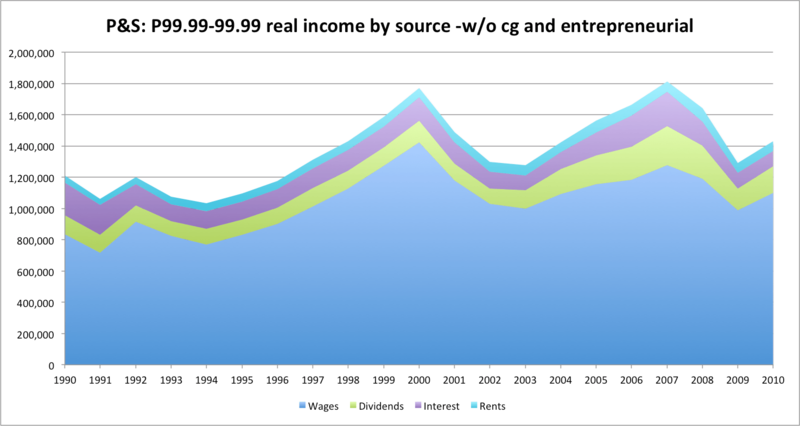 The temporary spike in capital gains realizations in the mid 80s obscures the large and permanent jump in “wage” and “entrepreneurial” income that happened between 1986 and 1988. 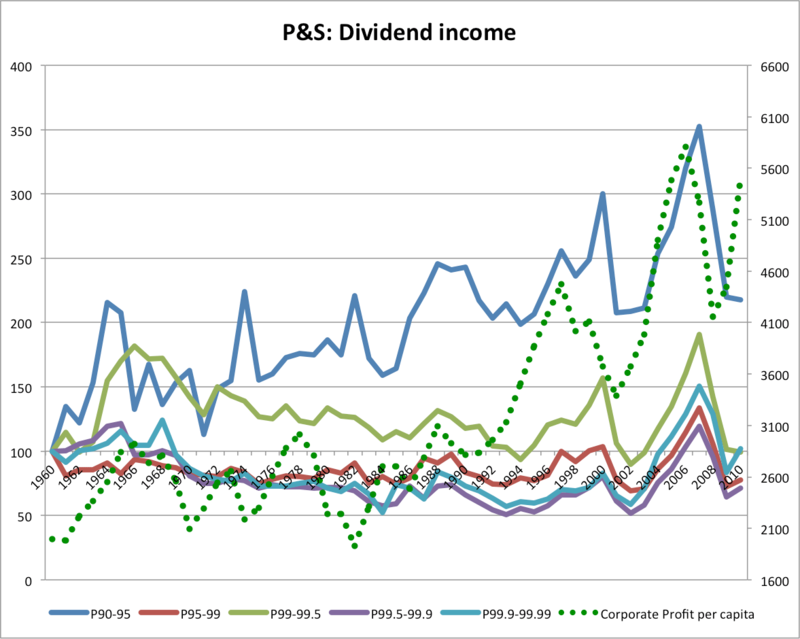 That said, dividend, rental income, and interest income — usually passive types of income, decrease in both relative and absolute terms. 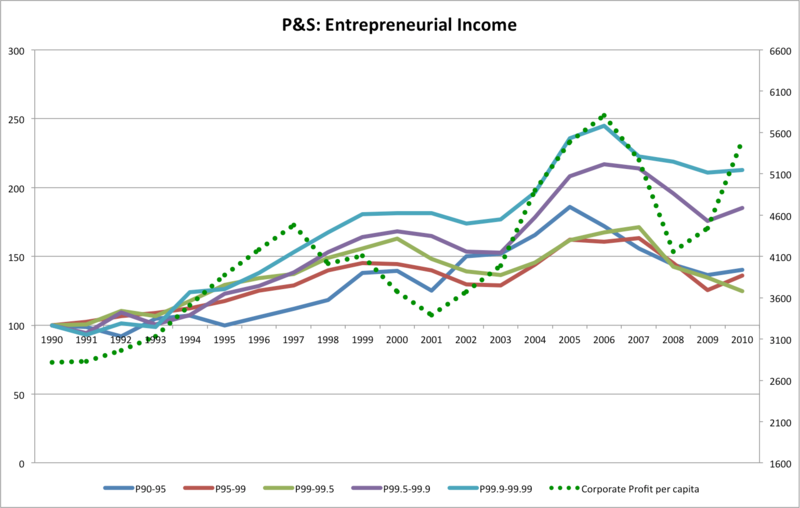 I rather suspect that after 1987 a growing share of entrepreneurs (especially owners of closely held businesses structured as pass-through entities) displaced the previous generation of passive “old money” types– their incomes simply got pushed into a relatively lower AGI group. 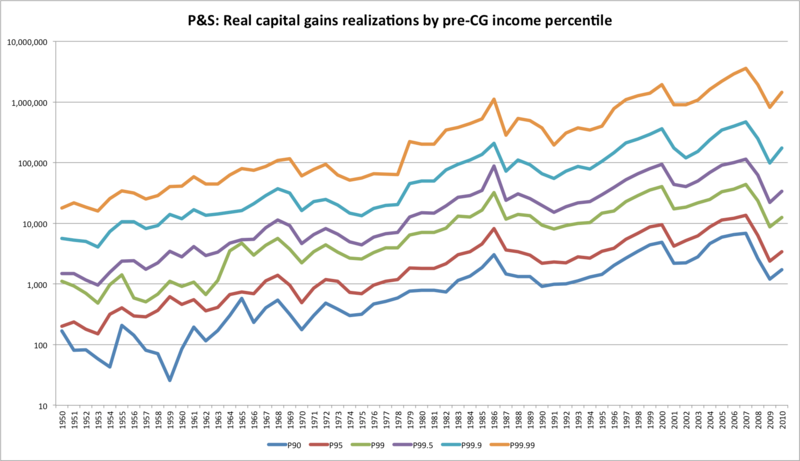 In any event, what I find interesting is that since 1990, after the most significant reductions to the top marginal rate and the tax code was reformed, there has only been a 30-40% increase in real (CPI-adjusted) non-capital gain incomes income at the highest reaches. 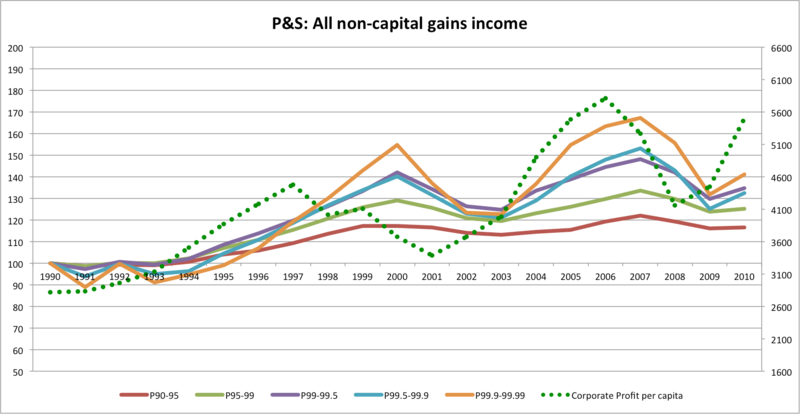 Observation: Not much more when you include the highly volatile capital gains component. Observation: “Wages” alone are only up ~30% for the two highest groups here and these are both quite clearly linked to the market. 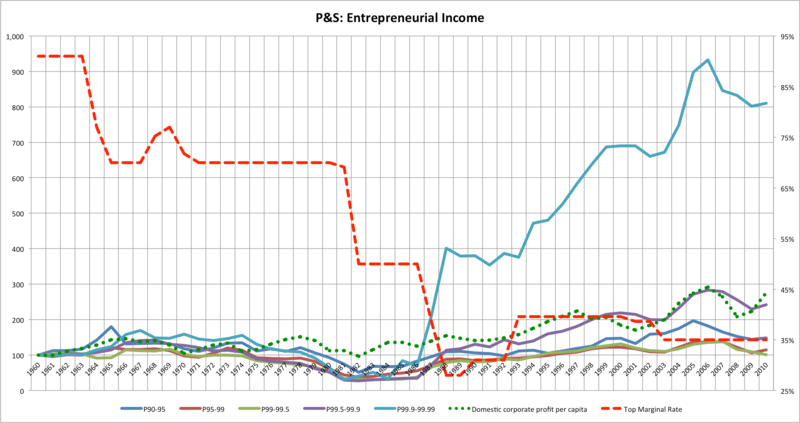 Observation: The entrepreneurial component is the only significant part that’s dramatically up (~2x) for the highest income groups and it in a relatively stable fashion. Now if we remove entrepreneurial and capital gains…. We get about a 16% “real” gain against their CPI index since 1990. I won’t claim it’s exactly this simple, since these various components are not necessarily as distinct as it might seem at the high end and some “entrepreneurial” income could be very similar to this “wage” income, but even allowing some fudge factor-it seems be roughly comparable to the comprensive income growth witnessed by most working people over a similar period of time (i.e., especially if we include healthcare and similar in-kind benefits). 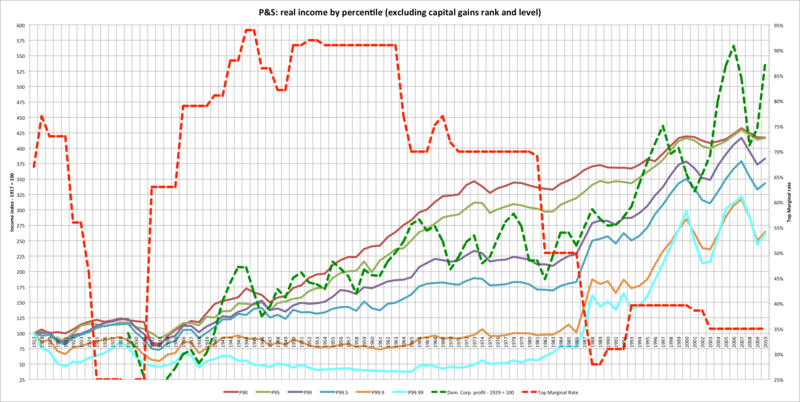 Please note that timing and composition of income gains amongst the top earners are very different along the grain you slice this (the top 1% itself is not nearly enough). 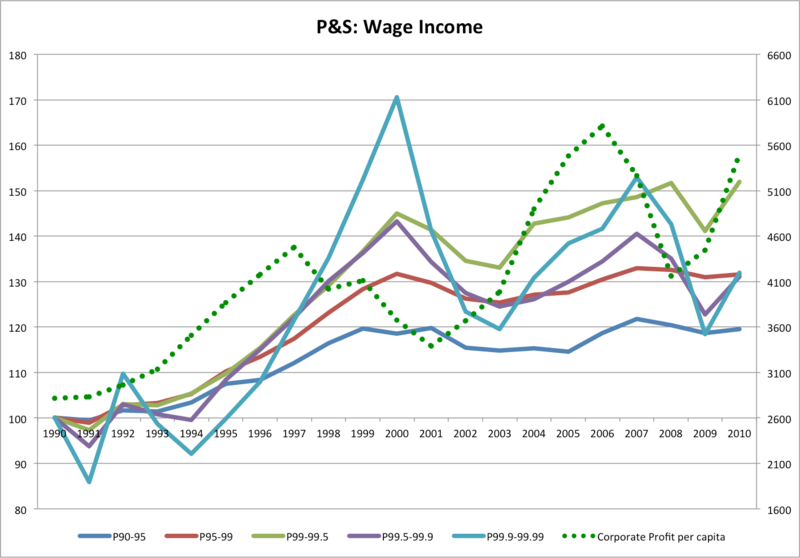 Observation: The professionals, management, top sales people and the like occupying the lower reaches of the top 1% see a steady growth in their “wages” incomes throughout the entire period. The jump post-tax change there, but it’s relatively muted and the trend doesn’t seem to change terribly much afterwards either. 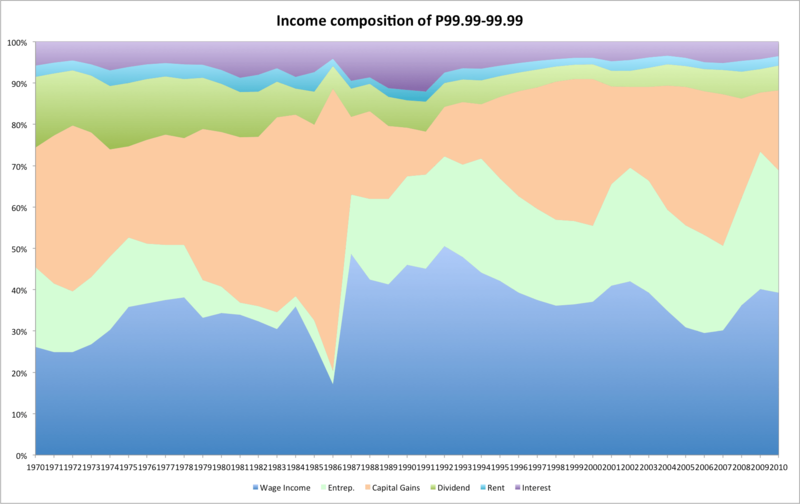 Now compare this to the very highest (P99.99-100) group P&S offer up….